Efficient neutralization of the exhaust gases from the automobile engines as well as development of the active and stable catalytic systems for pollution control remain actual challenge since the internal combustion engine was discovered. The present work was focused on the study of metal–metal and metal-support interactions taking place in the palladium- and rhodium-containing samples supported on delta-alumina. 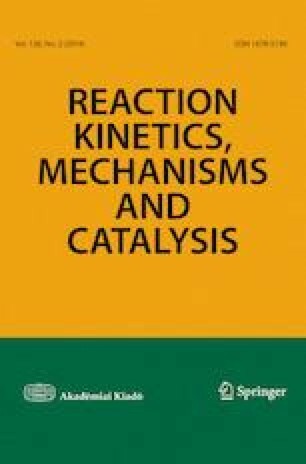 Catalytic performance of the catalyst was studied in three-way catalysis under both the stoichiometric and reductive conditions. Thermal stability was examined using a prompt thermal aging procedure. The samples were characterized by means of luminescence and UV–vis spectroscopies, since due to low metal loading the most of other characterization techniques was not applicable. All the samples were found to undergo deactivation during the aging procedure. However, in the case of the alloyed samples, the deactivation process is diminished due to a noticeable metal–metal interaction. The strength of this interaction increases along with decrease of palladium loading and reaches its maximum for PdRh32(alloy) system, which shows the best stability at 1000 °C. For the bimetallic system with Pd:Rh ratio of 4:1, an effect of reactivation was observed at 800 °C. After the aging at 800 °C, the sample has showed the improved catalytic activity. Then, being heated up to 1000 °C, the active metal particles were shown to undergo rapid agglomeration. The study was financially supported by the Ministry of Education and Science of the Russian Federation within the framework of subsidizing agreement of October 23, 2017 (No. 14.581.21.0028, unique agreement identifier RFMEFI58117X0028) of the Federal Target Program “Research and development in priority directions of the progress of the scientific and technological complex of Russia for the years 2014–2020”.